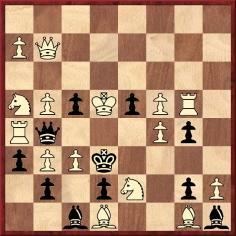 1 e4 e5 2 Nf3 Nc6 3 Bb5 d6 4 O-O Nf6 5 d4 Bd7 6 Nc3 exd4 7 Nxd4 Be7 8 Bg5 O-O 9 f4 h6 10 Bxf6 Bxf6 11 Nf3 Re8 12 Re1 a6 13 Bd3 b5 14 Rb1 (Eduardo Bauzá Mercére, New York, NY, USA). What material about Sherlock Holmes and Harry N. Pillsbury was published in 1964? Some puzzling complications arise from that apparently straightforward question. Richard Wincor’s name is familiar to Sherlock Holmes enthusiasts. 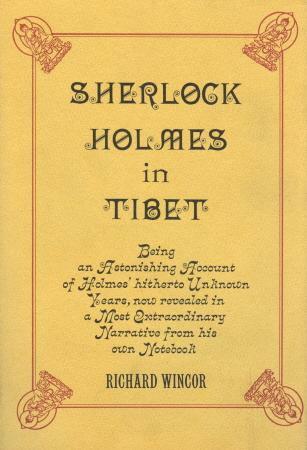 He wrote Sherlock Holmes in Tibet (New York, 1968), although that book had no chess content. Nor have we found anything by Wincor, or about chess, in the Baker Street Journal of the time indicated by Richman. 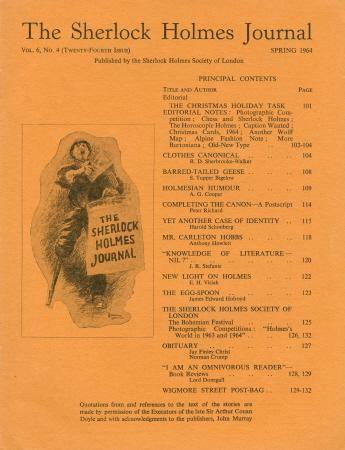 We have found that a Holmes/Pillsbury article, entitled ‘Yet Another Case of Identity’, was printed not in the US publication the Baker Street Journal but on pages 115-118 of the Spring 1964 issue of a London-based publication, the Sherlock Holmes Journal. 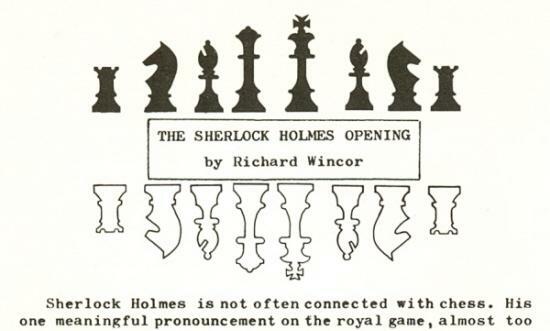 At present it is unclear to us on what grounds both Richman and Schonberg mentioned the Baker Street Journal, and why Wincor was named by Richman as the author of a 1964 piece on Holmes/Pillsbury entitled ‘The Sherlock Holmes Opening’. Does it really exist, in addition to Schonberg’s article of the same year on the same theme? 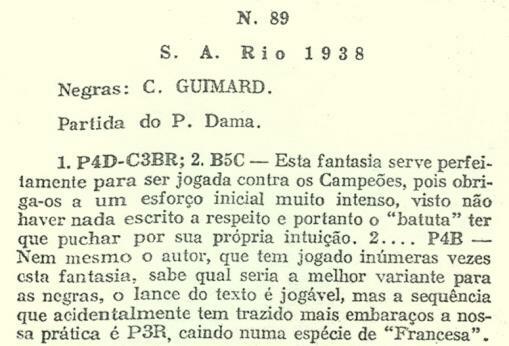 So now the claim, on the basis of two 1953 magazines, is that, 15 years after Schuster v Carls was played, Torre believed that he had refuted the combination with 10 Qd2, overlooking 10...gxf2+. The text does not suggest that Torre played the game himself. 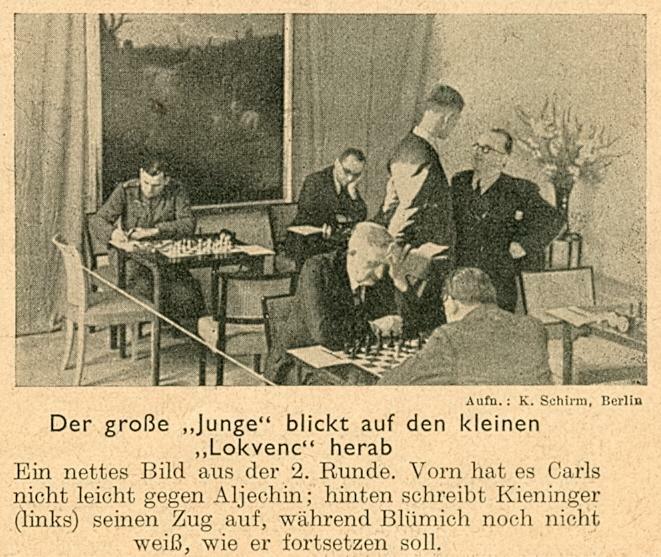 Carl Carls also appears in this photograph from page 167 of the 1 November 1941 Deutsche Schachblätter. Taken in Cracow on 7 October 1941, it shows G. Kieninger and M. Blümich in the background, K. Junge in conversation with J. Lokvenc and, in the foreground, C. Carls and A. Alekhine. 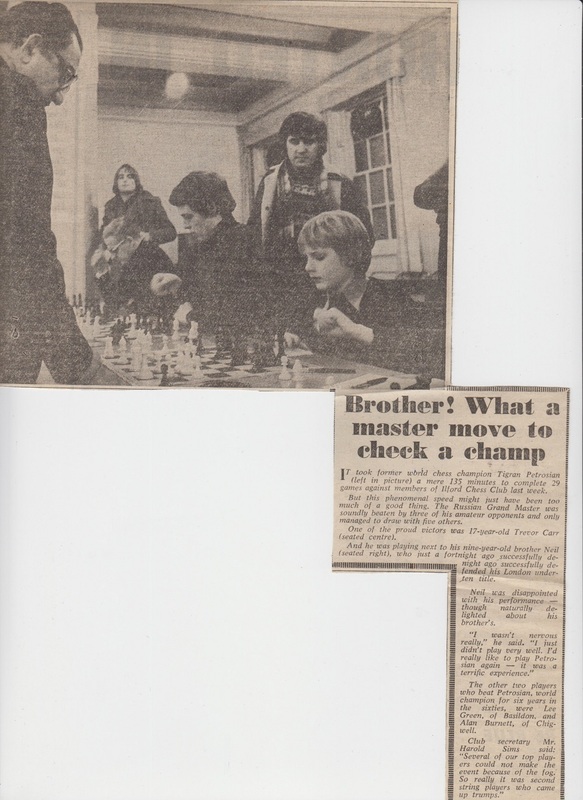 We have now found a further cutting, from an unidentified local newspaper dated 26 January 1978, with a photograph from Petrosian’s display and stating that it took him ‘a mere 135 minutes to complete 29 games against members of Ilford Chess Club last week’. On the right is Neil Carr (aged nine), and seated next to him is his 17-year-old brother, Trevor. 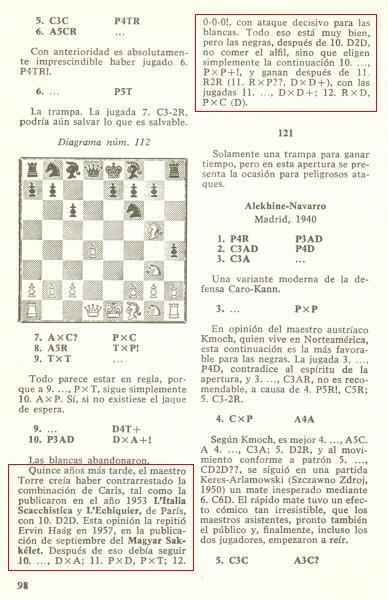 Trompowsky v D. Alexander, Buenos Aires, 1939 (pages 163-165). 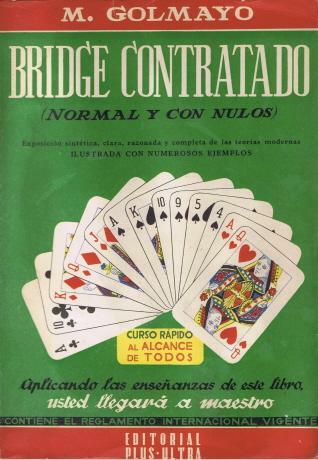 All the above-listed games were annotated by Trompowsky. His victories against Endzelins and Kiproff were played on 22 and 29 August 1936 respectively, and the former game thus remains the earliest specific instance known to us of 1 d4 Nf6 2 Bg5 being played by Trompowsky. Round 17: 1 d4 e6 v Illa. 1) Alexander v Marshall (C.N. 3508): 1 e4 e5 2 Nc3 Nf6 3 Bc4 Bc5 4 d3 O-O 5 Bg5 c6 6 f4 d6 7 Nf3 b5 8 Bb3 a5 9 a3 Qb6 10 Bxf6 Bf2+ 11 Ke2 gxf6 12 Qd2 Na6 13 Ba2 Nc7 14 g3 Ne6 15 f5 Nd8 16 Rhf1 Bc5 17 Nh4 d5 18 Qh6 d4 19 Na4. 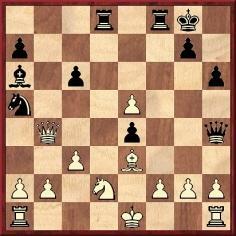 2) J.R. Capablanca v Morgan (C.N. 3778): 1 e4 d6 2 d4 Nf6 3 Bd3 Nc6 4 Ne2 e5 5 c3 Be7 6 O-O O-O 7 h3 exd4 8 cxd4 Bd7 9 Nbc3 Nb4 10 Bb1 Nc6 11 d5 Na5 12 f4 g6 13 e5 Nh5 14 g4 Ng7 15 Qd3. Our correspondent asks what more is known about this event and whether any games have survived. 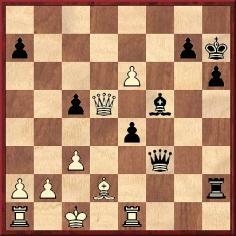 27...e3 28 Qxf3 exd2+ 29 Kd1 Bc2+ 30 Kxc2 dxe1(Q)+ 31 Kb3 Qxe6+ 32 c4 Qb6+ 33 Kc3 Qxb2+ 34 Kd3 Qd4 mate. Information on this game is sought. A rather easier picture question this time: who is the master? In C.N. 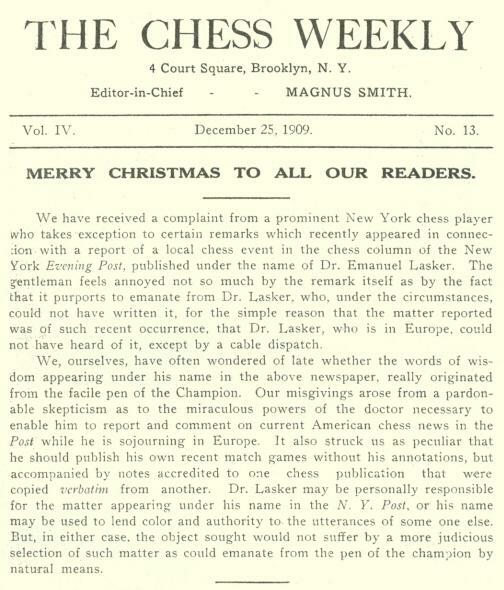 3634 we asked for information about the British Chess Bulletin, a scarce monthly publication edited by H.T. Dickinson from October 1910 to January 1911. Nothing having been received so far, we renew the request. 32 Qxe7 Rhd8 33 Qxd8 Resigns. Our correspondent also provides three articles by Hermann Helms in his Brooklyn Daily Eagle column. For the first time since he lost his match with Capablanca at Havana, Boris Kostić, the Serbian champion, put in an appearance in this city yesterday, visiting both the Manhattan Chess Club and the I.L. 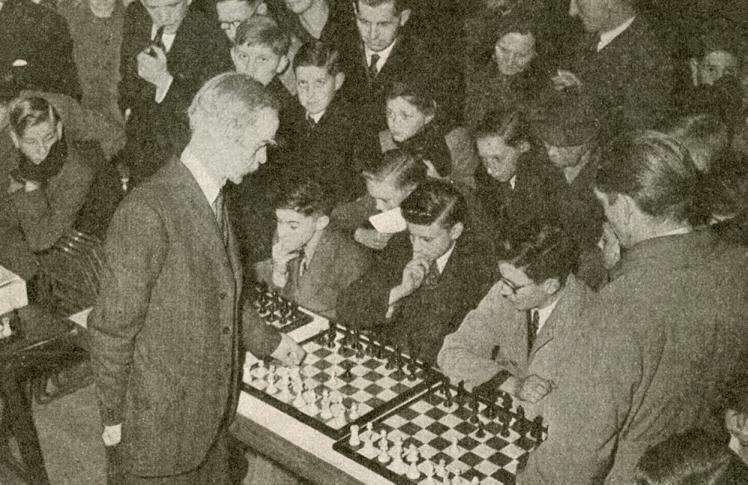 Rice Progressive Chess Club, where friends greeted him and tendered their condolences. Kostić in the interim has been at his home in Gary, Ind., where, like many another notable, he has been putting in a part of his time chopping down trees on his father-in-law’s farm. Although this exercise at the start yielded a fine crop of blisters, it was, nevertheless, fine training for the chess master, who is planning to go abroad to take part in the Victory Tournament of the British Chess Federation at Hastings, 11-23 August. Kostić looked a bit thinner than when he was here last, but he says he lost 18 pounds while in Havana, nor was he sorry to lose it. He is down to fighting weight, so to speak, and, with an ocean voyage thrown in, he will be fit to do himself full justice when the Mayor [of] Hastings officially declares the international masters’ tournament under way. 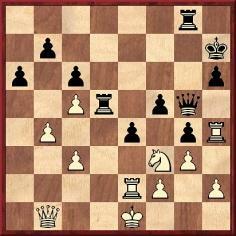 1 e4 e5 2 f4 exf4 3 Bc4 Nf6 4 Nc3 Bb4 5 Qf3 Nc6 6 Qxf4 O-O 7 Nf3 Bxc3 8 dxc3 d5 9 exd5 Re8+ 10 Be3 Na5 11 White resigns. 20...Qg5 21 Qf3 Qxe5 22 Rae1 Qd4+ 23 Qe3 Qxd5 24 Rf2 Bh3 25 g3 h5 26 Rd2 Qc6 27 Nd3 Re6 28 Ne5 Qb7 29 Qf2 Rf6 30 Qc5 Re8 31 Red1 Rf5 32 Qc6 Qa7+ 33 Kh1 Rfxe5 34 Rd8 Qe3 35 Rxe8+ Rxe8 36 Rg1 Bf5 37 White resigns. 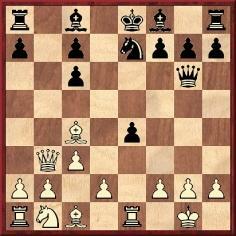 37...exf3 (‘Instead, as pointed out by Janowsky, Black might have won offhand and prettily by means of 37...gxf3 38 Rc2 Qxh4, and White dare not capture queen, on account of ...Rg1 mate.’) 38 Re3 Rgd8 39 h3 Kg7 40 hxg4 fxg4 41 c4 Rd4 42 Qa1 h5 43 Kf1 Kf6 44 Re1 Qf5 45 Kg1 Kg6 46 b5 cxb5 47 cxb5 Qxc5 48 bxa6 bxa6 49 Qxa6+ R4d6 50 Qa2 Qd5 51 Qc2+ Qd3 52 Qc5 Qd5 53 Qc2+ Kh6 54 Qc1+ Kg6 55 Qc2+ Kh6 56 Qc1+ Kh7 57 Qc2+ Kg8 58 Qc1 Qf5 59 Qc4+ Rd5 60 Re4 Rc8 61 Qa4 Rd2 62 Re1 Re2 63 Rd1 Rce8 64 Qc4+ Kh7 65 Qc3 R8e7 66 Qb4 R2e4 67 Qc3 Re2 68 Qb4 Kg6 69 Rc1 R2e4 70 Qd2 Qb5 71 Qd6+ R7e6 72 Qf8 Re8 73 Qd6+ R4e6 74 Qd2 Rc6 75 Ra1 Rce6 76 Qc2+ Kh6 77 Qc1+ Qg5 78 Qc3 Qe5 79 Qd2+ Kg6 80 Qc2+ Qe4 81 Qc5 Qe5 82 Qc2+ Kg7 83 Rd1 R8e7 84 Qc4 Rc7 85 Qa4 Rec6 86 Rh1 Rc2 87 Rh4 Rc1 88 Kh2 Rxd1 89 Qxd1 Qb2 90 Qe1 Kf8 91 Rxh5 Re7 Drawn. Eli Hiltch (Ramat Gan, Israel) has drawn our attention to an on-line cumulated index of the Baker Street Journal, which enables us to clarify the Pillsbury matter discussed in C.N. 5257. 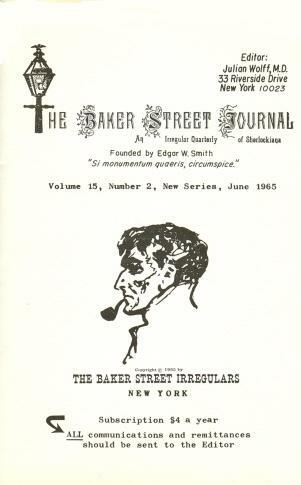 A story entitled ‘The Sherlock Holmes Opening’ by Richard Wincor was published on pages 92-94 of the June 1965 issue of the Baker Street Journal. 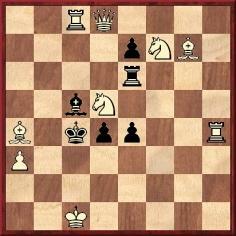 1 d4 d5 2 e3 Nf6 3 Nd2 c5 4 c3 Nc6 5 f4 Bg4 6 Be2 Bxe2 7 Qxe2 e6 8 Ngf3 Be7 9 Ne5 O-O 10 O-O Ne8 11 Qg4 ‘Black swooned’. The magazine (page 128) described Richard Wincor as ‘a practicing attorney and an expert on copyright law’. He later wrote Baroque Chess Openings (Boston, 1972). 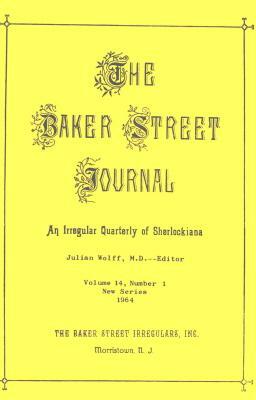 In that same issue of the Baker Street Journal (pages 83-85) there was an article by Harold C. Schonberg (on Holmes and music, not chess), reprinted from the New York Times of 7 March 1965, and the fact that he had items published in both the Baker Street Journal and the Sherlock Holmes Journal in 1964-65 may explain why he confused the two publications when writing about Pillsbury in his book Grandmasters of Chess (C.N. 5257). 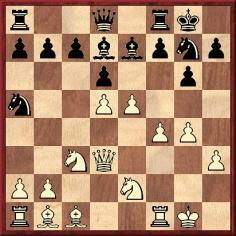 (ii) Practical Chess Openings by R. Fine (Philadelphia, 1948). 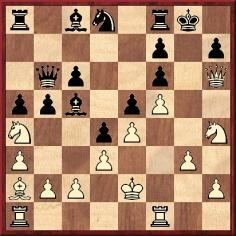 Alekhine’s Defense: Columns 1 and 2 of MCO v 1 and 2 of PCO; column 23 of MCO v 20 of PCO; column 21 of MCO v 17 of PCO. Bird’s Opening is practically identical for most variations and footnotes. The Bishop’s Opening has many copied sections. 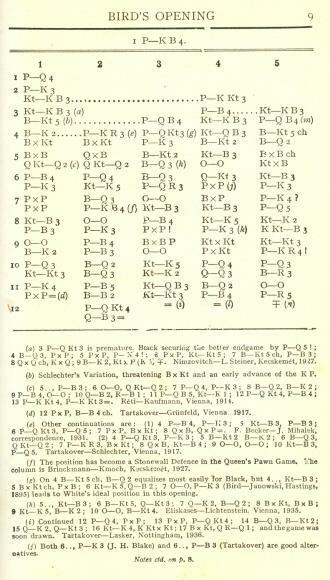 Thus Fine’s material in the sixth edition of MCO was used both by Korn in the seventh edition of MCO and by Fine himself in PCO. The rights and wrongs of such practices seem far from clear-cut. 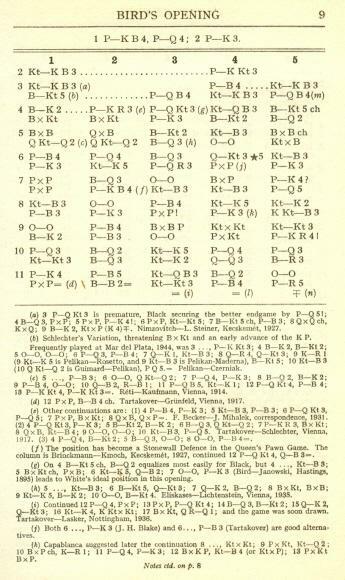 The above comes from page 39 of Chess Potpourri by Alfred C. Klahre (Middletown, 1931). What more is known about the ‘composition’? What facts are available regarding this suggestion that Emanuel Lasker’s column in the New York Evening Post may have been ghosted? 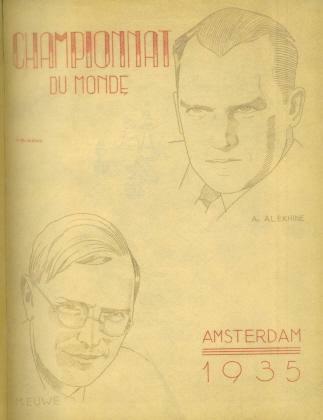 We should like to draw together any other comments by Alekhine, either at the time or afterwards, on the overall status, value or importance of the 1934 match. We quoted that passage from page 986 of L’Echiquier, March-April 1935, which mentioned that the interview had first appeared in Kasseler Neueste Nachrichten, 17 December 1932. Can a reader provide a copy of that original publication? 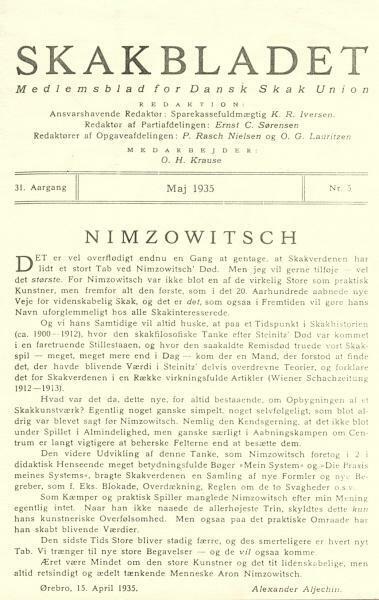 Javier Asturiano Molina (Murcia, Spain) asks about an article by Alekhine in Skakbladet after Nimzowitsch’s death. 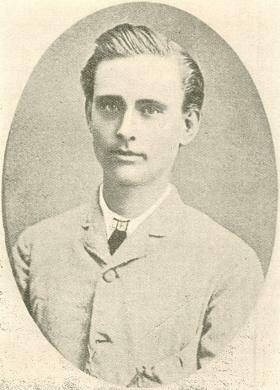 ‘Mr S.G. Luckcock began to play chess at the age of 21 and in a year or two won the “Championship” of a local chess club. 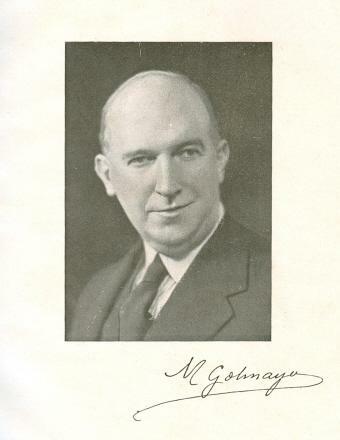 He is now the present holder of the “Chess Amateur” Correspondence Championship for North London, which he won in April 1929, and the London and Middlesex Group C.C. since July 1935. He took up correspondence play because his business did not give him time to belong to a Club, even locally. He is a quick solver and very rarely sets up a position, but likes solving from the printed diagrams. 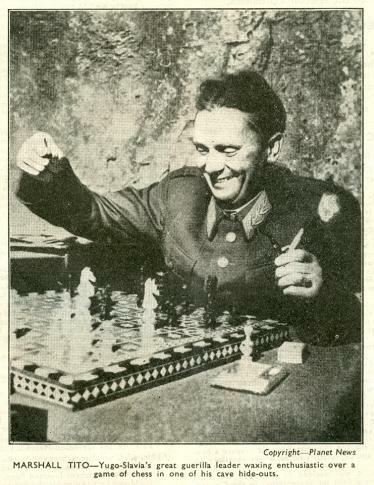 This photograph was published on page 167 of CHESS, May 1951 and shows H.E. Atkins giving a 12-board simultaneous display in Leicester. 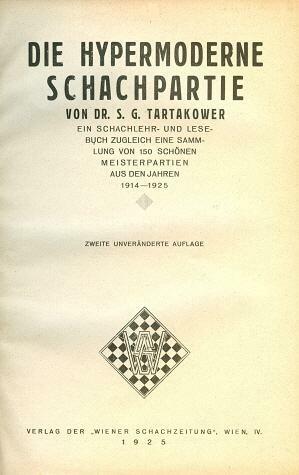 David Lovejoy (Mullumbimby, NSW, Australia) notes that chess sources are inconsistent as to the publication date of Tartakower’s Die Hypermoderne Schachpartie and asks for clarification of the correct year. 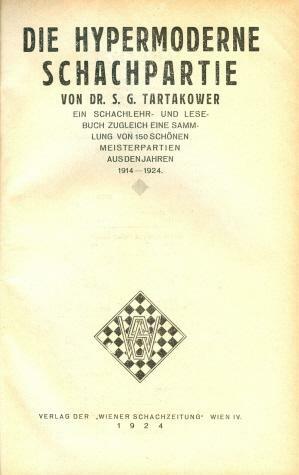 The latter (‘zweite unveränderte Auflage’ – the second unaltered edition) was reproduced by Edition Olms, Zurich in 1981. 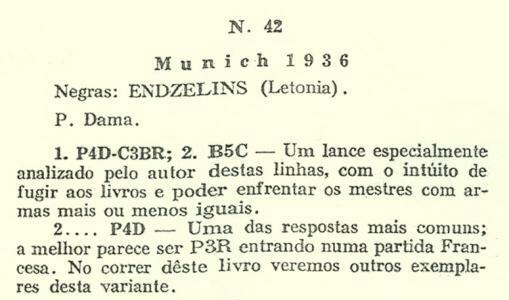 In addition, our collection contains instalments 1-6 of the book (pages 1-384), all of which are dated 1924. Since much of the information provided is false, supplying citations would indeed have been awkward. 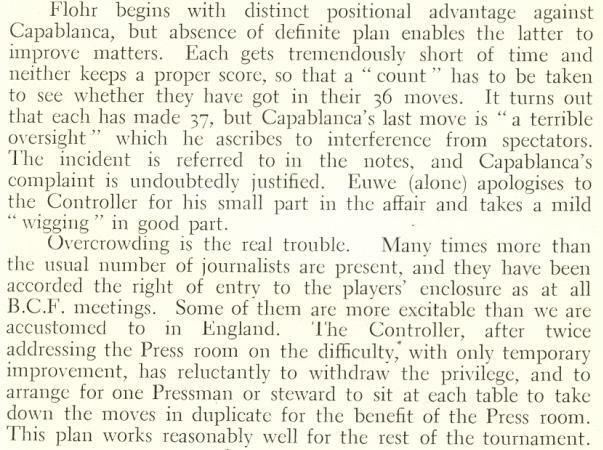 Yet Pandolfini has not even made an effort regarding simple dates, whose margin of error ranges from a year (Capablanca’s birth, on page 75, and the publication date of Murray’s A History of Chess, on page 171) to a century or so (the founding of the American Chess Magazine, on page 67). Page 202 indicates that Marcel Duchamp lived to be 97 (‘1871-1968’), and it is all hit and miss. Thus whereas Morphy’s birth and death dates (1837 and 1884) are given correctly on page 67 (twice, in fact), page 20 states ‘1836-84’, while page 96 has the right digits but in the wrong order: ‘1843-87’. Page 158 claims that ‘purists use [the term Zugzwang] to indicate positions where neither player wants to move, though in general chess parlance it also means that a particular player doesn’t want to move’, but no such mysterious purists are identified. 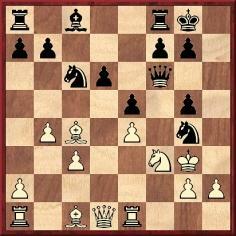 Plain English does not come naturally to Pandolfini, even in his explanations of basic chess terms. On page 15 the skewer is defined thus: ‘Attack forcing an enemy unit off a line, exposing a unit or square.’ Nor is he comfortable with other languages. 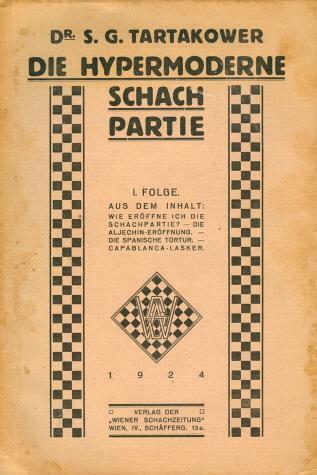 Page 174 refers to ‘La Palamede’, instead of Le Palamède, while page 253 unsuccessfully attempts to give the word ‘chess’ in seven random foreign languages (including ‘Scacci’ in Italian and ‘Schak’ in Danish). History, of course, is mangled. 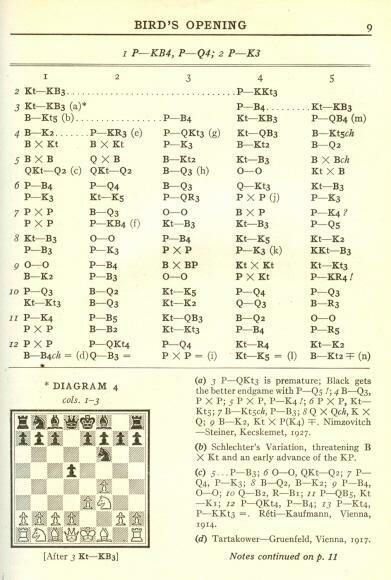 Page 63 states that Capablanca made perfect scores at tournaments in New York in 1913 and 1914, but the Cuban participated in no tournaments in New York in 1914. 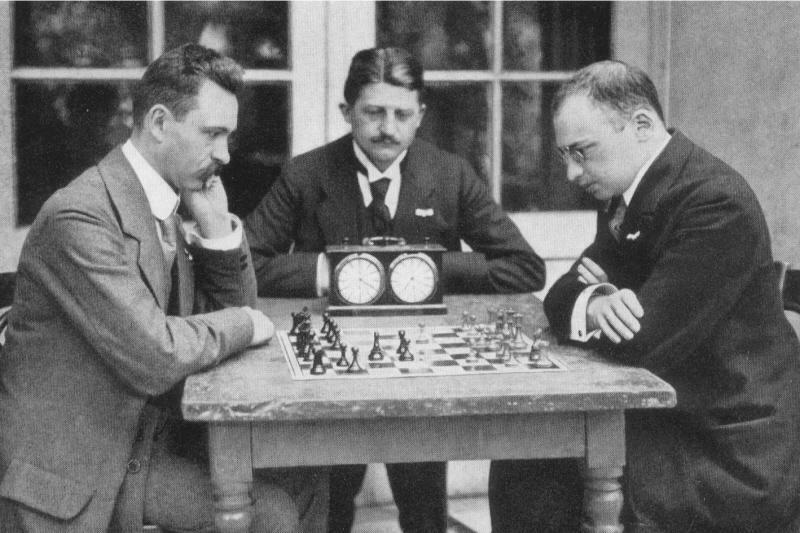 Pandolfini even believes (pages 102-103) that Capablanca’s famous exhibition game in Moscow against Ossip Bernstein (29...Qb2) was played in the St Petersburg, 1914 tournament. Spurious games are attributed to Napoleon (pages 92-94). 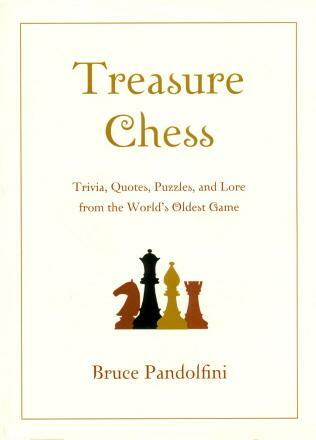 Page 166 reports that chess was probably created in A.D. 450 and that the board became chequered in A.D. 110. The latter date, of course, is just one more typo. The book’s treatment of quotations could hardly be worse. Napoleon’s name is somehow dragged in again on page 272 for this description of chess: ‘Too difficult to be a game, and not serious enough to be a science or an art.’ On page 234 the remark about life being too short for chess is ascribed to both Lord Byron (1788-1824) and Henry James (1843-1916), instead of Henry James Byron (1835-1884). The imprint page of Treasure Chess warns, ‘No part of this book may be reproduced in any form or by any means’, and anyone who cares about accuracy and truth will unhesitatingly comply. 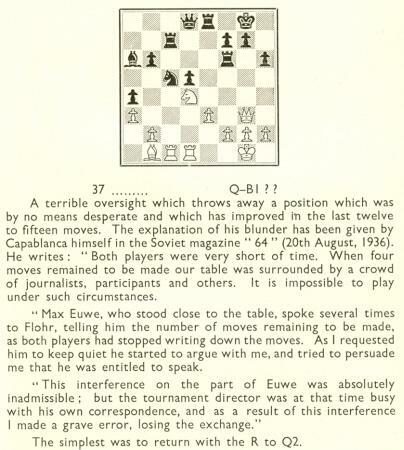 ‘With regard to Ernst Klein and his involvement with the 1935 world championship match, and in particular his expulsion from the playing-hall during the 28th game, here are two quotes from books on that match. “Im Laufe des Abends ereignete sich leider ein unerfreulicher Zwischenfall. Ein junger Mann, ein Ausländer, Schachspieler mit beginnendem Renommee, dem Wettkampf mit Pressekarte beiwohnend, widersetzte sich hartnäckig einer Anweisung des Komitees, obwohl die diesbezügliche Pflicht auf den Pressekarten ausdrücklich vermerkt stand und für den Widersetzungsfall der Entzug der Pressekarte angedroht wurde. Als sich nun der Besagte durchaus nicht fügen wollte, wurde er von einem Mitglied des Komitees aufgefordert, seine Pressekarte abzuliefern und das Gebäude zu verlassen. Diese Aufforderung beantwortete der Unglückselige damit, daß er den betreffenden Herrn mit der Faust ins Gesicht schlug. Der “rasende Reporter” wurde schließlich polizeilich abgeführt. Jon Crumiller (Princeton, NJ, USA) sends a cutting from page 4 of the Wisconsin publication the Whitewater Register of 31 July 1858. Readers are naturally advised to treat it with great prudence. ‘In 1913, the Melbourne Leader conducted a problem-solving competition, with extra points for “cooks”, “duals”, proofs of impossibility and so on. There were many real problemists in Australia then, and great solvers, a vanished band. The star solver was “Petros” (Dr Bennie). One three-er of [C.G.] Watson’s had been cooked by Petros. Smarting under this set-back, Watson composed the three-er here diagrammed. 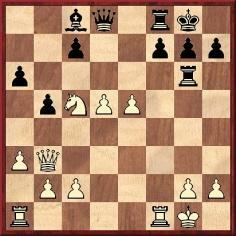 ‘First of all, it can be absolutely proved that Black’s last move must have been either ...P(B2)-B4 or ....P(K2)-K4. The solution is 1 PxQBP e.p. or 1 PxKP e.p. This is not a dual solution as of course Black cannot have laid himself open to both en passant captures, but only either one or the other. No wonder this masterpiece of ingenuity hoodwinked the cognoscenti. 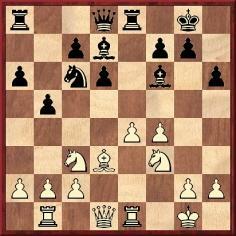 An en passant key is not permitted unless it can be demonstrated that Black’s last move was a double pawn hop. 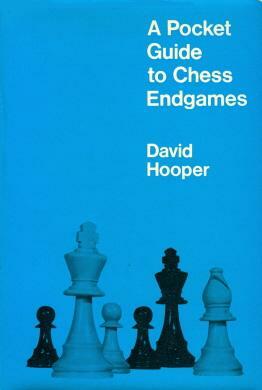 It will be seen that David Hooper’s detailed article referred to his definition of Zugzwang on pages 196-197 of A Pocket Guide to Chess Endgames (London, 1970). Our inscribed copy includes his handwritten errata sheet, dated 4 September 1971, and readers wishing to receive it are invited to contact us. 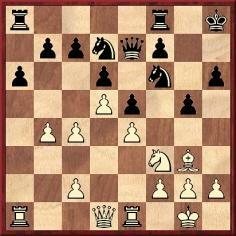 10...Bh3 11 g3 Rd8 12 d4 Nd5 13 Nd2 f5 14 Nf3 Bd6 15 Bg5 Qh5 16 Bxd8 Qxf3 17 Bf1 Bxf1 18 Kxf1 e3 19 Qc2 Kxd8 20 Kg1 f4 21 White resigns. 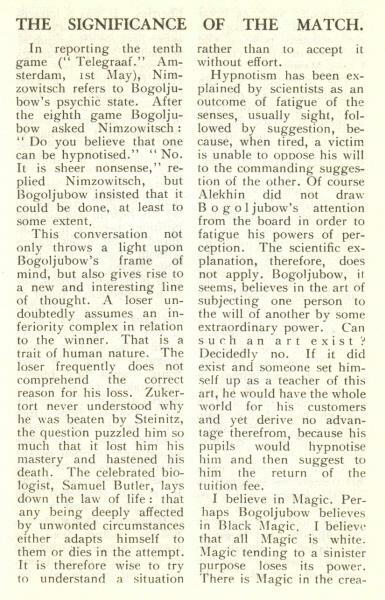 Source: American Chess Bulletin, November 1919, page 249. The Bulletin did not name the allies and merely said that the game had been played ‘recently’. We have not found the score in the Schweizerische Schachzeitung. On page 7 of the January 1920 issue of the American Chess Bulletin Herman Voigt of Philadelphia stated that Lasker’s 10...Bh3 was questionable, as it could have been met by 11 Bxf7+ Qxf7 12 Qxf7+ Kxf7 13 gxh3, after which the e-pawn cannot be saved. C.N. 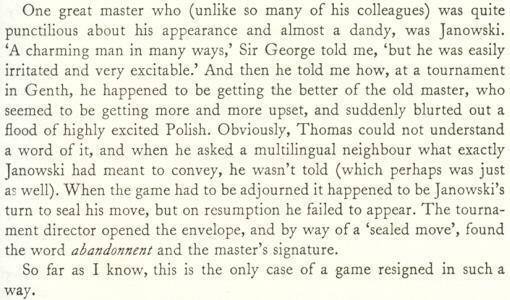 4942 referred to a report that, in a game against Sir George Thomas, Dawid Janowsky resigned by writing ‘abandonnent’ in the adjournment envelope. No occasion was specified in the report, but Janowsky’s only loss to Sir George Thomas was apparently at Marienbad, 1925. 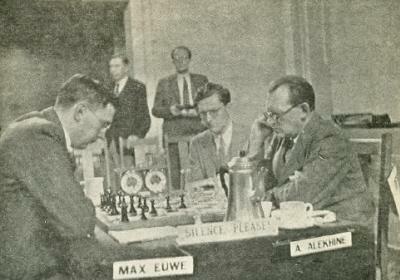 The two masters played each other twice in a 1926 tournament in Ghent, but both games were drawn. Information is still lacking regarding Rudolph Pokorny, who starred in The Capablanca-Pokorny Fiasco. 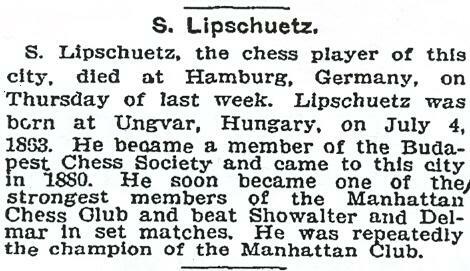 A player named Pokorny participated in the 1919-20 Manhattan Chess Club Championship (American Chess Bulletin, April 1920, page 71), finishing last with half a point, and his loss to R.T. Black was published on page 7 of the January 1920 issue. However, nothing has yet been found concerning his identity. 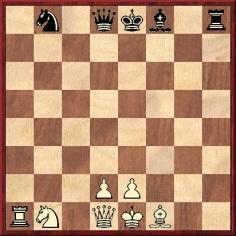 This exceptional chess figure will be discussed in the next C.N. item. An obituary on page 217 of the 21 July 1905 issue of La Stratégie described his talent as ‘un phénomène extraordinaire’, while pages 330-331 of the August 1905 BCM stated that ‘the loss to the chess world is irreparable’ and a ‘calamitous event’, yet most chess encyclopaedias are without an entry for him. Even so, he is by no means forgotten in general chess literature and received recognition on, for instance, pages 7 and 63 of Wonders and Curiosities of Chess by Irving Chernev (New York, 1974). 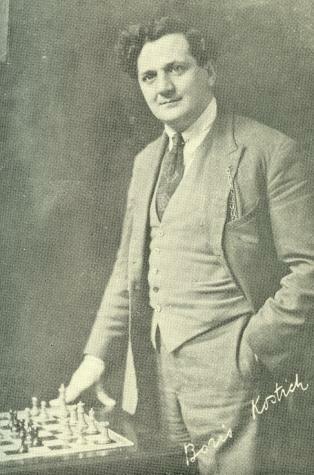 The highest praise also appeared on pages 278-279 of the August 1905 American Chess Bulletin, which was the source of the photograph of Mackenzie given in C.N. 5289. 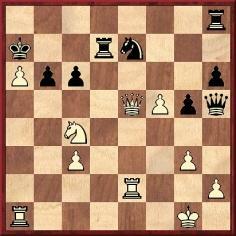 Black announced mate in three: 14...Qf4+ 15 Bxf4 exf4+ 16 Kh3 Nf2. The volume ended with a ‘list of preliminary supporters’ (more than three pages) which included Lord Randolph Churchill, Samuel Loyd, Charles Maurian and Sir Robert Peel. 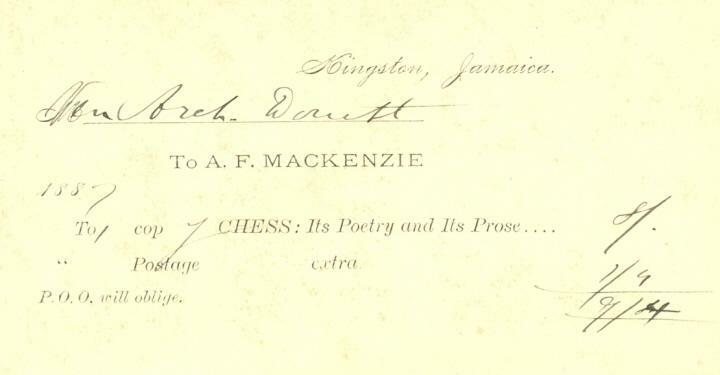 Mackenzie’s posthumous book Chess Lyrics (New York, 1905) was brought out by A.C. White, and a brief supplement was published the following year. ‘In a bookstore I recently came across two boxes of books and other rare and interesting chess material which once belonged to Paul Hugo Little (Litwinsky). C.N. 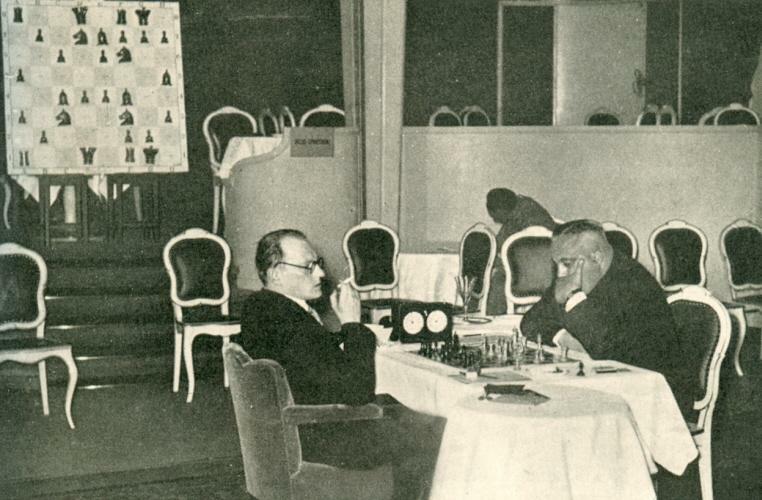 4935 showed him at the board with Euwe and Alekhine during their game at Nottingham, 1936, in a photograph taken from Chess Review, and I wonder if he was seated there as an indirect result of the disturbance created by Euwe and others during the Flohr v Capablanca game in the third round (see A.J. 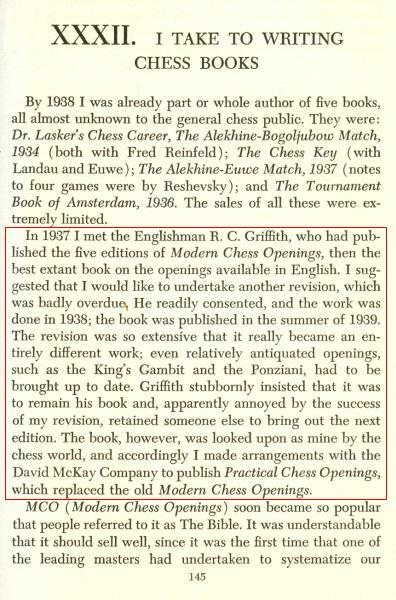 Mackenzie’s comments on page 3 of the tournament book, as well as Alekhine’s note to Capablanca’s 37th move on page 59), although he may have received that privilege through his donation of prizes (page xiv). 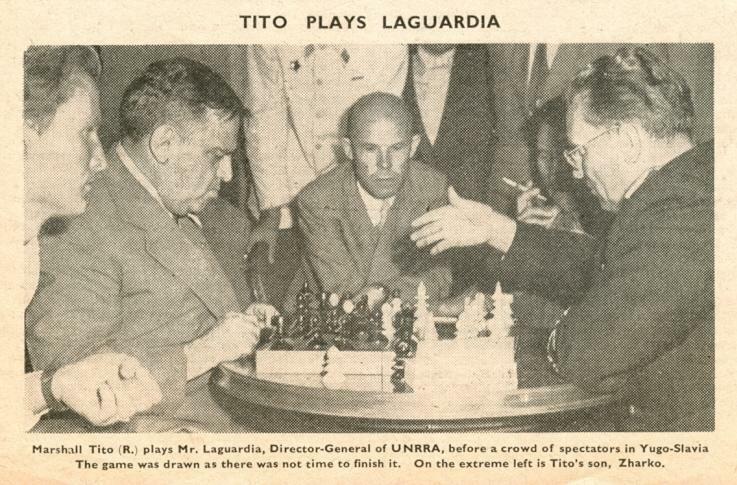 I am interested in learning more about this incident, which may have cost Capablanca sole possession of first place. As regards P.H. 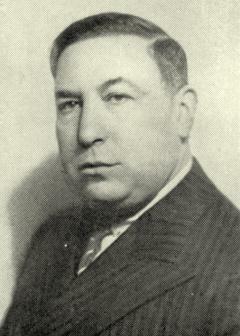 Little, when still in his teens he had chess poetry published (American Chess Bulletin, September-October 1934, page 127 and December 1934, page 162). He later wrote non-chess fiction (under pseudonyms) and non-chess non-fiction. 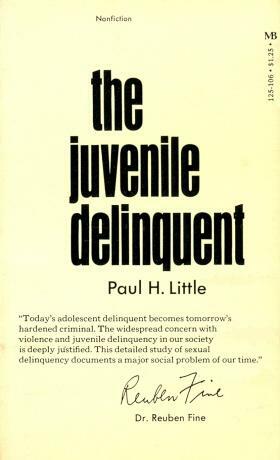 In the latter category we own an inscribed copy of The Juvenile Delinquent (New York, 1971), which had a five-page Introduction by Reuben Fine. 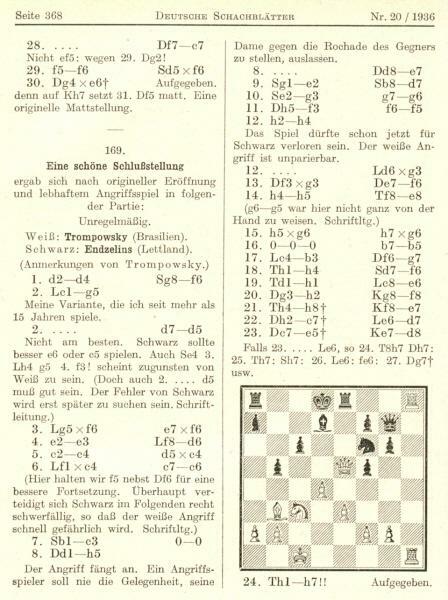 The pictures appeared in CHESS, in November 1944, page 17, and September 1946, page 285 respectively. 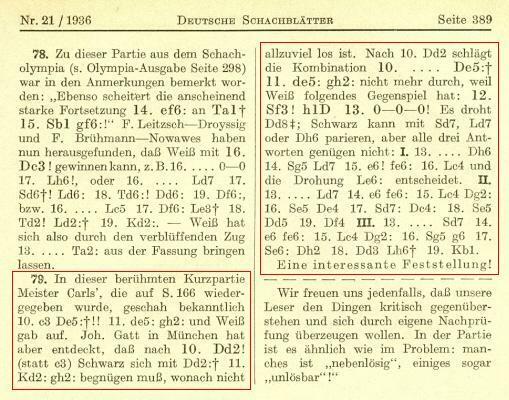 The first photograph was included in a set of four on page 233 of Persönlichkeiten und das Schachspiel by B. Rüegsegger (Huttwil, 2000). From various Portuguese and Brazilian websites we note that Trompowsky’s forename takes an acute accent on the a: Octávio. 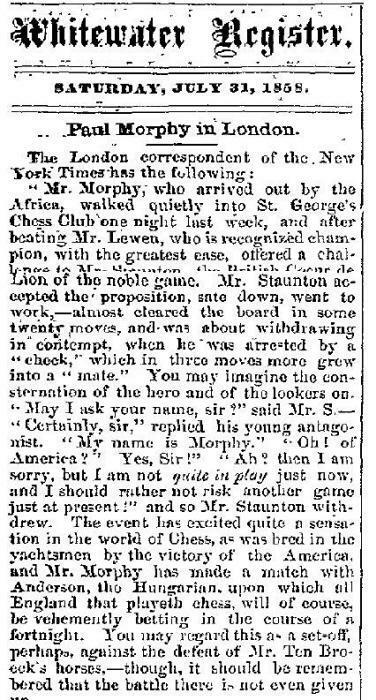 Pete Tamburro (Morristown, NJ, USA) asks why, in his Spirit of the Times chess column, Charles H. Stanley used the title Chess Player’s Magazine when referring to the periodical that he edited (1846-47), whereas it is commonly known as the American Chess Magazine. Both titles were used. 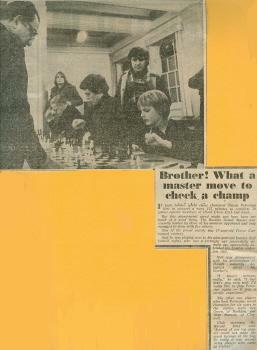 ‘The American Chess Magazine’ appeared on the cover, as shown, for instance, on page 82 of David DeLucia’s Chess Library. A Few Old Friends (Darien, 2003), whereas ‘The Chess Player’s Magazine’ was the headline on the journal’s pages. 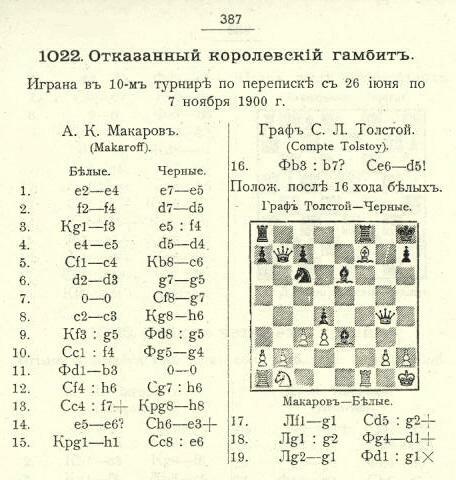 A reprint of the Magazine was produced by the Publishing House Moravian Chess, Olomouc in 1999. Our correspondent notes, in particular, that 1880 is given as the year of the master’s arrival in New York. 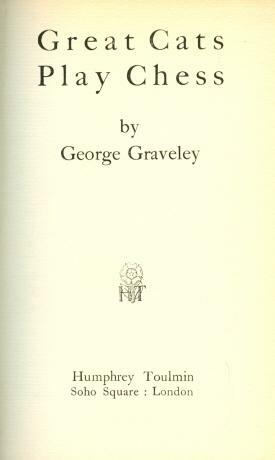 Great Cats Play Chess by George Graveley (London, 1935) is a three-act play, set in 1662-63, which has nothing to do with either cats or chess. The title is a double metaphor for the romantic scheming which involved the Countess of Castlemaine and Frances Teresa Stuart vis-à-vis King Charles II of England. 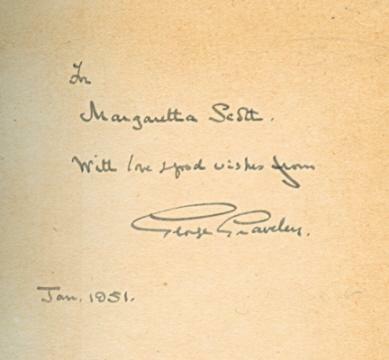 Our copy of the book, which seems to be very rare, was inscribed by Graveley to the English actress Margaretta Scott (1912-2005). 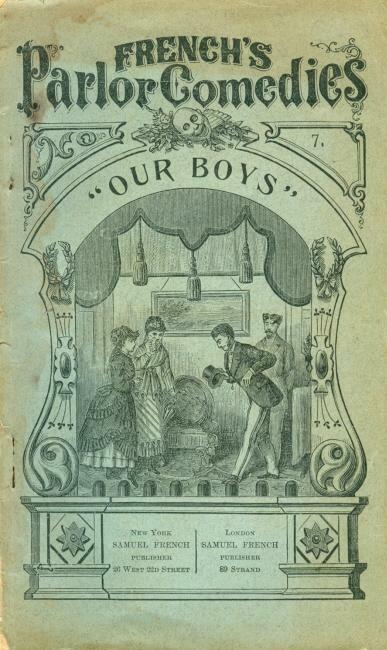 In book form we have various editions of the play, which received its première at London’s Vaudeville Theatre on 16 January 1875, ran until 18 April 1879 and was promoted as ‘the most successful comedy ever produced’. None of the nineteenth-century volumes in our collection is dated. 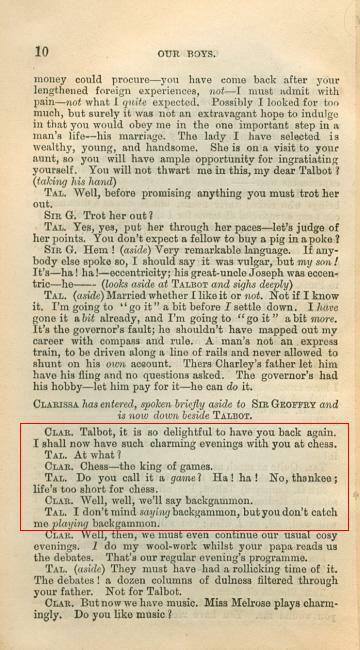 When mentioning Our Boys in a footnote on page 270 of A Chess Omnibus we gave ‘1880’, that being the British Library catalogue’s earliest date for any published edition of the play. For background information on Byron, as well as the complete text of Our Boys, a valuable book is Plays by H.J. Byron edited by Jim Davis (Cambridge, 1984). The Introduction (page 1) mentions that Byron was ‘the most prolific playwright of the mid-Victorian period’, that he invented the pantomime characters of Buttons and Widow Twankay and that the four-year run of Our Boys broke all known records. 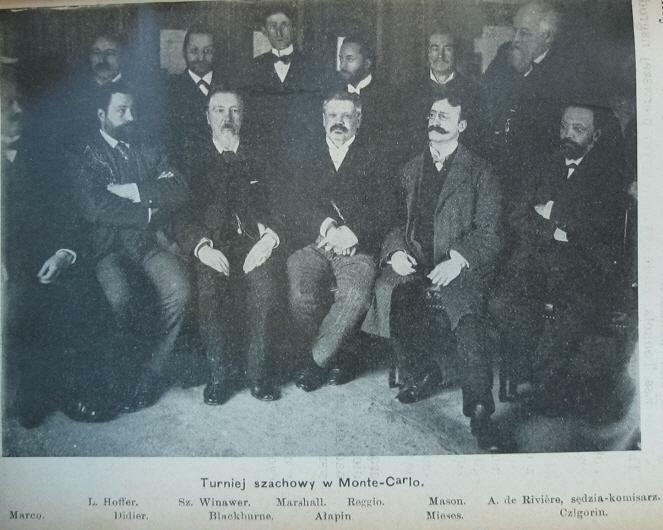 Tomasz Lissowski (Warsaw) submits the above group photograph of Monte Carlo, 1901, published in that year’s Sport, a Polish weekly periodical. He asks whether a copy of better quality can be obtained. Copyright 2007 Edward Winter. All rights reserved.